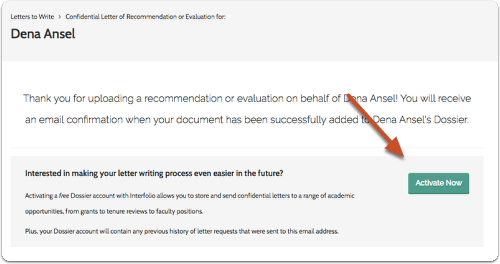 When a letter of recommendation is requested from you, you will receive an email notifying you of the request. 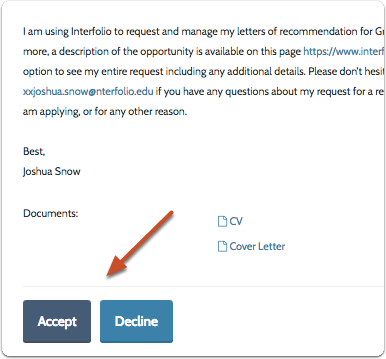 After receiving a request, you can upload the letter directly to Interfolio, or, if your requester has provided you with a document request form, you may choose to mail your letter to Interfolio. When a letter is requested from you, a free Dossier account is created for you. 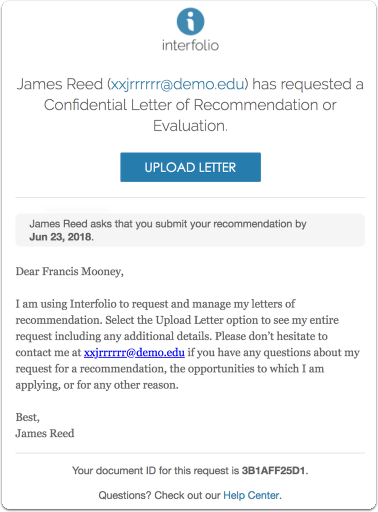 You don't have to use your Interfolio Dossier account to upload letters of recommendation to Interfolio, but we invite you to activate your free account to help you organize, track, and store and send all of your recommendation and evaluation requests. Note: Some organizations require signatures on letters of recommendation, including letters submitted electronically. Please check to make sure your letter is signed if the requester has indicated that a signature is required. See here for information on adding a signature to a letter. 2. 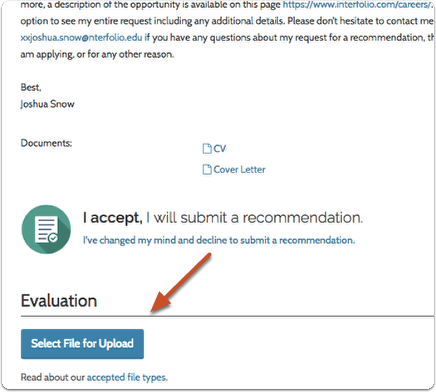 Click "Accept" or "Decline"
You can choose to accept the request and begin the process of writing and submitting a letter, or you can decline the request. No matter which option you select, you can change your mind later. 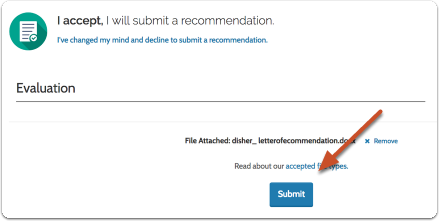 If you accept the request for a recommendation, a link will appear at the bottom left of the page for you to submit your letter. 4. Upload your file and click "Submit"
You will see a confirmation message after you submit your letter. 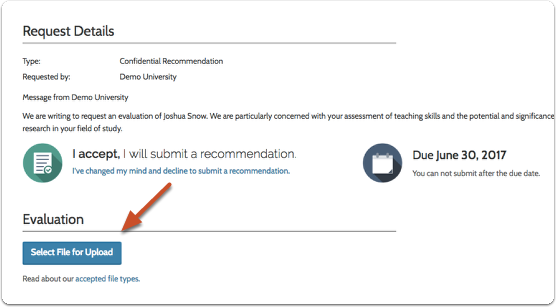 You will also receive a confirmation email when your recommendation is successfully added to the requester's Dossier. 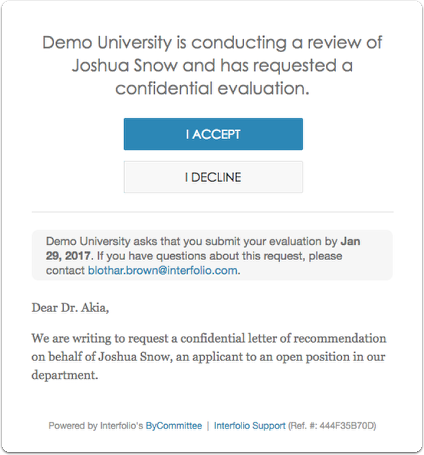 You do not have to use Interfolio's Dossier service to submit your letter, but a free account is created for you when a user requests a letter from you through our system. We invite you to sign in so you can track your letter and use our other great features for managing the letters you are requested to write. 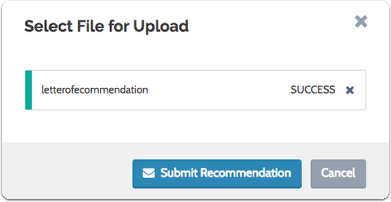 The requester will be informed of your decision when they check the status of the request in their Dossier account. Note that you have the option to change your mind. To get back to this screen, click the link in the request email. 2. 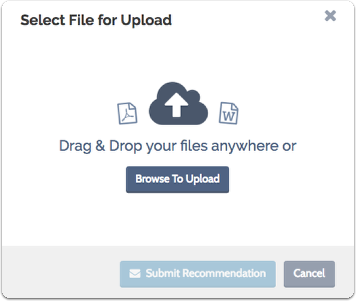 Click "Select File for Upload"
Your document will be sent to the appropriate committees for review. Click "Activate Now" to activate your free Dossier account. 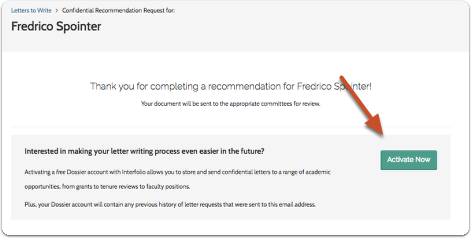 Activating your free account with Interfolio allows you to store and send confidential letters of recommendation for candidates to a range of academic opportunities, from grants to tenure reviews to faculty positions. We will help you keep track of all your letter requests and submitted letters. 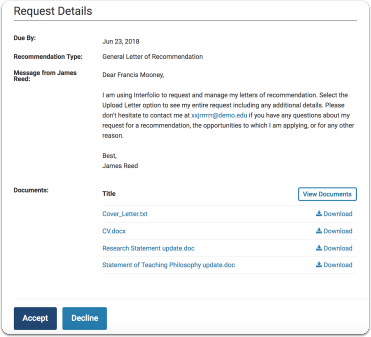 For example, you can track any previous history of letter requests that were sent to the email address you used for the letter you just submitted.